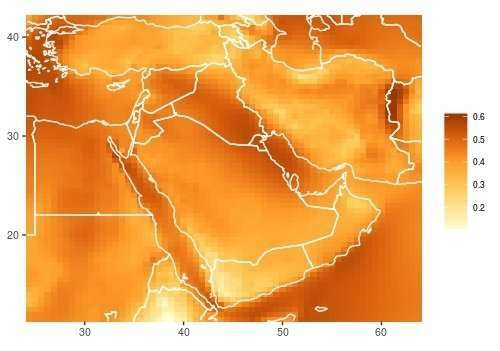 "We are very enthusiastic about taking this work forward," says Udaya Gunturu, who studies atmospheric processes at KAUST. "Wind turbines on the Earth's surface suffer from the very stubborn problem of intermittent wind supply," says Gunturu. This has led researchers and energy companies worldwide to look upwards and explore the possibilities of the strong and reliable winds at high altitudes. Flying a wind turbine on a kite-with the electricity being delivered to the ground through its tether-may seem an unlikely scenario, but several companies worldwide are already testing prototype systems. "Optimal altitudes for the turbines vary by region and with time of year and time of day," says Yip. "In general, the abundance of the airborne wind-energy resources increases with altitude." "Our work may help Saudi Arabian wind-energy technology to leapfrog into the future and fulfill the Kingdom's Vision 2030 plan on the development of renewable energy resources," says Stenchikov.